Addison Bohannon: "The Rationals of the Cantor Set"
Have a question? Post it to the Forum! See also recent forum posts. Thanks to all for a great semester! All homework assignments are posted at Homework Assignments. See homework expectations and how to write proofs for guidelines on my expectations. See also new mathlets posted for visualizing the composition of functions here and for the definition of continuity here. Are some infinite sets "larger" than others? Can a sequence of numbers be rearranged to converge to a different number? How many discontinuities can a function have? You may understand 1, 2, and 3 dimensional objects. But what about 1.5-dimensional objects? What do voting, donuts, the streets in Manhattan, and Facebook have in common? Answering these questions requires the rigorous, axiomatic approach to definition, theorem, and proof, which is the foundation of theoretical mathematics. Along the way, you will pick up more proof-writing skills, and also skills that enable you to better read, understand, and communicate mathematics. I will also describe how the field of analysis fits into the broader "picture" of mathematics. SCOPE A one semester course providing a rigorous introduction to the calculus of a single variable. The course is designed to introduce the student to the foundations of the calculus necessary for advanced undergraduate and graduate studies in applied mathematics and engineering. Course coverage includes a treatment of the structure of the real number system, sequences, continuous functions, and differentiation. 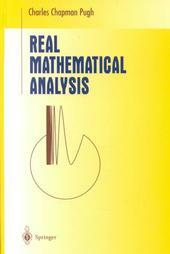 A recommended supplemental text is Principles of Mathematical Analysis by Walter Rudin. This is a classic text upon which most other real analysis texts are based. The emphasis of this course is your ability to read, understand, and communicate mathematics, so most of the course grade will be based on homework assignments. There will also be three WPR's and two course projects. Click here for my expectations on written work, including documentation, etc. Final grades will be assigned in accordance with USMA D/Math policies. The graded homework will be the primary means of evaluating and providing feedback on your progress. I expect you to complete all of the problems listed on the syllabus, and more if necessary for understanding. I will collect the homework and make every effort to provide prompt feedback on your work. Whenever you write up a problem, always (i) rewrite the problem, in your own words, (ii) state clearly the givens in the problem, and the goal, and (iii) use formal mathematical language. See also the page on how to write proofs. Homework will be collected about once a week. See the expectations on homework and grading. I recommend that you work on homework in groups, and come in for AI whenever necessary. You are strongly encouraged to ask questions on the discussion board. I will post answers there. Your grade will be based in part on your participation in the online wiki (as part of your homework grade). I will be able to see what contributions you have made to the site, and grade you accordingly. There will be three midterms and a final. Each exam will cover a single chapter (or portion thereof). Problems on exams will be similar to those on homework assignments. For each exam, the class will collaboratively develop a glossary which they can use for the exam. The final will be comprehensive. The projects will involve researching and writing about a topic of your choosing. The projects will be posted on the course wiki, and reviewed by fellow classmates. In the Web2.0 world, more and more of reading, writing, and communicating mathematics occurs online. A major component of the course will be the course wiki at http://usma387.wikidot.com, which will provide an opportunity for you (as students) to collaborate together, and for me (the instructor) to make answers to your questions visible to all. Post some information about yourself (this will not be visible to anyone outside the class). Ask questions of your Professor and fellow students. Collaboratively write a glossary of definitions for use on exams. There are substantial resources available online to help you learn the Wikidot markup, which is quite simple. You will also need to learn the basics of TeX, the standard language for typesetting in the mathematics community. My door is always open for questions, help, or other matters. Feel free to stop by anytime. Schedule an appointment if you want to be sure I'm in my office. Feedback is extremely valuable to me. Please let me know if there's anything that irks you (or that you really like). I will also solicit feedback several times during the semester. Your honesty is always appreciated. It is extremely important to keep up with the work in this course. Late homework will be subject to a 10% per day deduction. Makeups for exams and other activities must be arranged at least a week in advance. Document all help received on homework and projects in accordance with USMA policies. WPR's and the TEE will be closed book, closed notes with the exception of the online glossary. No calculators will be permitted. See further guidelines on assigned work. Real analysis abounds with the surprises and beauty that makes mathematics so inviting. Most students find that it is not an easy course… you should expect to put a lot into this course, but I expect that you will get a lot out of it as well.